My 7 year old son and I are in Las Vegas over the holidays. We have been enjoying the warm desert weather and looking at the palm trees. After being here for a little while, I decided that it was time to find some vegans to hang out with. I checked on the internet and found a vegan cookie swap was being held at a local coffee shop. What a brilliant idea! Thanks to my friend Karin, for giving me a good sugar cookie recipe, I got up early and baked some snowman cookies that my son then decorated. At the last minute, I realized that the decoration goop that I’d given him to use on the cookies had some powdered cow’s milk in it. What? Since when do they put animal products in those little tubes of decorating stuff? What a pain. 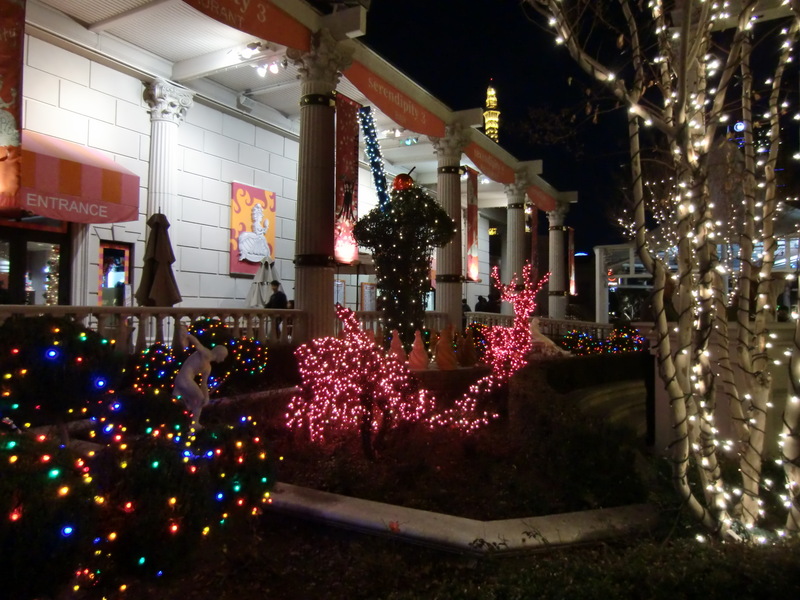 I grabbed some undecorated ones which we fortunately had set aside, and headed out. We arrived at the gathering where we met a lovely group of vegans. There were so many different kinds of cookies that showed up! Pumpkin, chocolate peanut butter, uncooked chocolate oatmeal, to name a few. We exchanged treats and chatted about veganism. 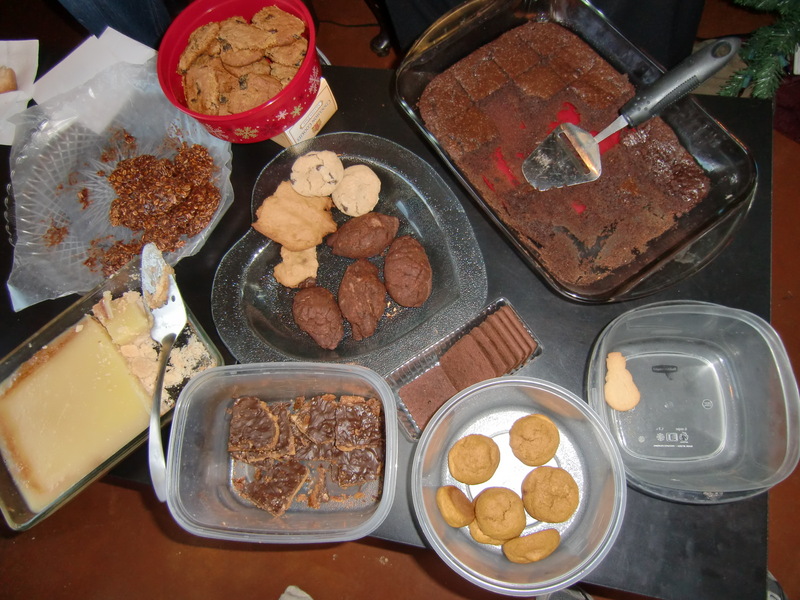 By the time it dawned on me to take a photo, most goodies had been confiscated, but here is a sample of what was shared. I always feel comfortable around other vegans; it bonds young and old in a way that nothing else quite seems to do. There was another 2-year-old vegan child there that my son enjoyed watching reach for the cookies. What a relief to mingle with like-minded folk. 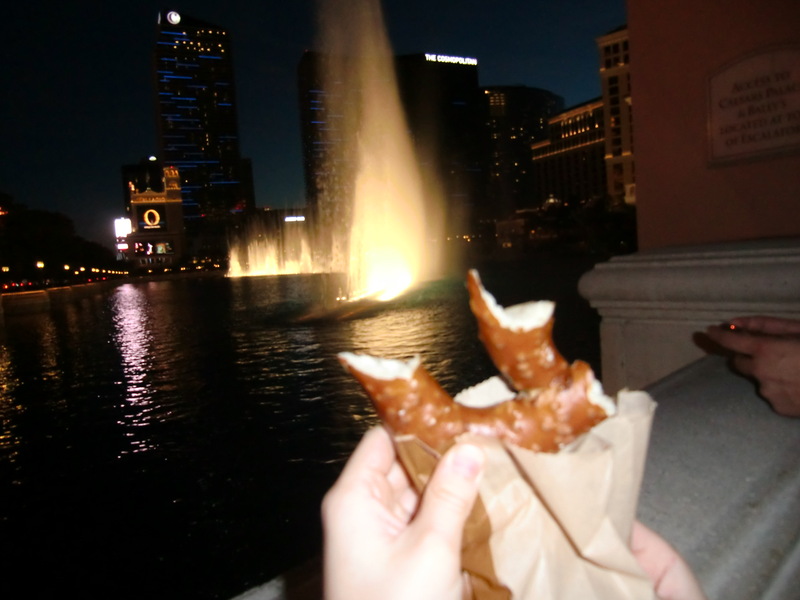 We stopped to grab a pretzel to snack on while watching the beautiful light show. The music was spectacular; what fun on a warm evening. 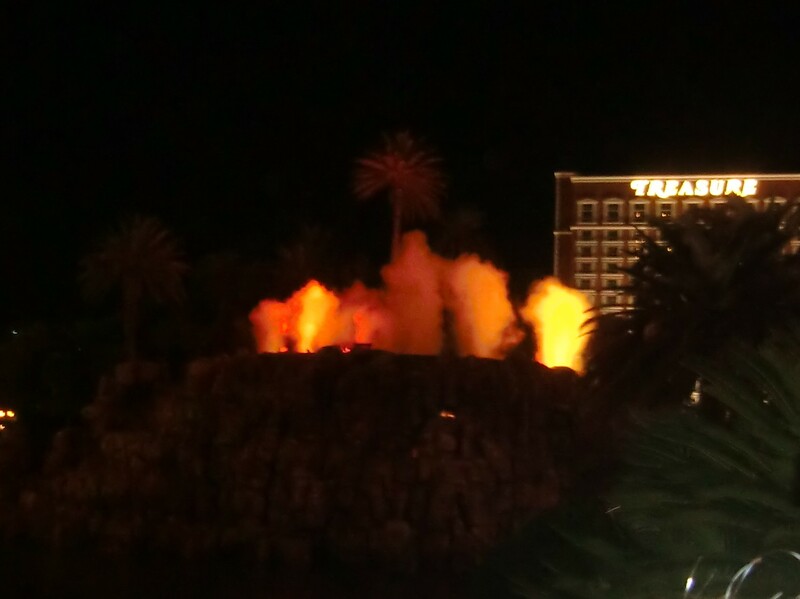 We wrapped up the evening by watching the volcano light show at the Mirage Hotel. Cool stuff for a 7-year-old. As we walked through the Imperial Palace casino on the way back to our car, we stopped to listen to an Elvis impersonator. What a treat to experience all the lights, the people and the feel of excitement in the air. It’s almost as if there is no recession, no war, no animal suffering. 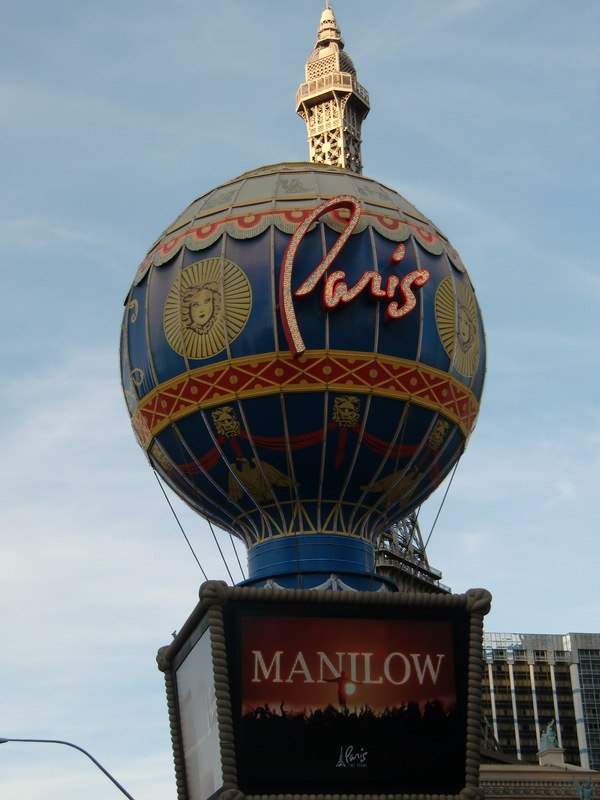 There is no place like Vegas, that is for sure. 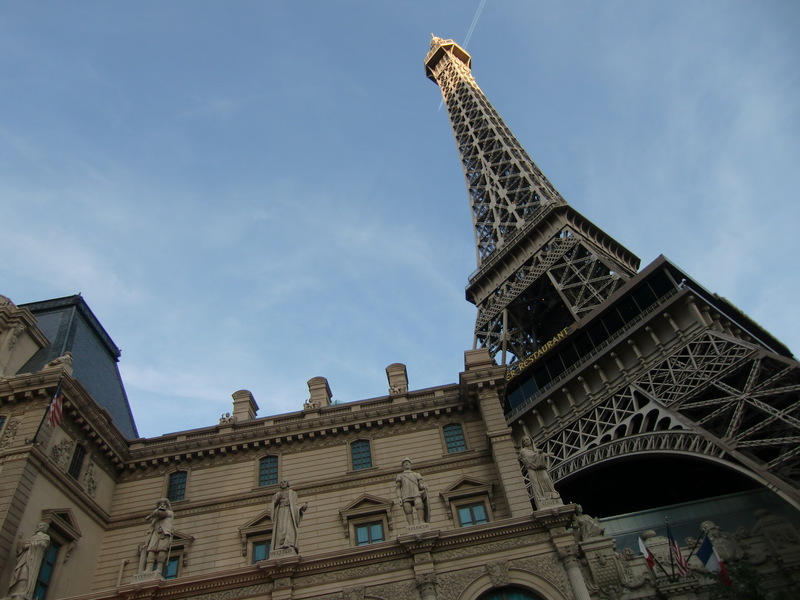 Earlier in the day at the vegan gathering, it was mentioned that Las Vegas is not a particularly veg-friendly town. Give it some time, I say. If there are continued meet ups with tasty vegan food amidst the nice folks that we met today, more and more people will find vegan living hard to resist. What a great post! Thank you for sharing your cookies and your time with us! 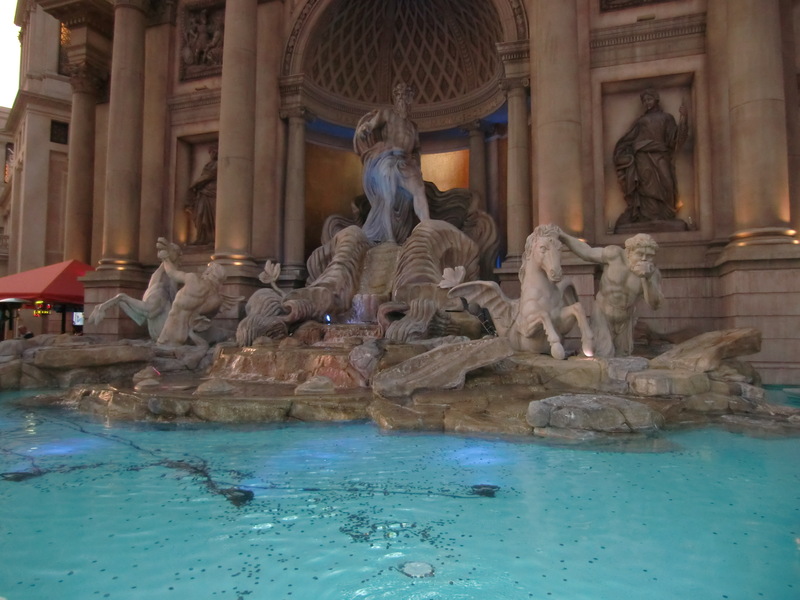 I am so glad you are having a wonderful time in Vegas…I am very envious…not so much of the glitz but more because of the warm weather and serene desert that surrounds you!!! Cool that you found a vegan cookie swap that is something that anyone could try to start in their city. I really enjoyed bringing my scrumptious lemon cake to a Christmas Eve gathering last night….I know that a lot of vegans suggest not telling carnists (ha! yahoo just underlined ‘carnists’ with their red squiggly line to tell me it isn’t a word….baloney!) that a recipe is vegan and they won’t even know the difference…but to me that is the whole point! I just love saying ‘no animals were harmed in the making of this product’….I say it with a smile in a joyful tone and then I INSIST that they take a bite….most people are surprised and say, “It doesn’t taste vegan” ….I don’t know exactly what that means?….do they really think that omitting eggs, butter or milk makes a cake so foreign? Well, whatever their train of thought….at least their taste buds are happy…and when I comment that now it is cholesterol free and lower in fat and healthier for them, sometimes they even want the recipe….saving the animals….one bite at a time! Way to go, Lori. Every time you show that there are delicious alternatives, it gives people a choice. They may grumble about it but they notice. It takes courage to be different. Keep it up! I was listening to the radio— the commentator said “with the way food prices are going, people will have to become vegetarian.” The silver lining of the recession.